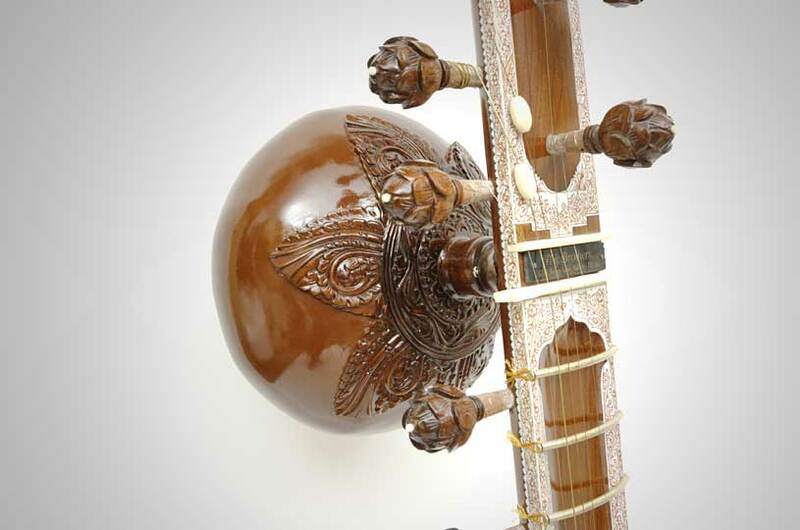 As the top model of the manufacturer P. & Brothers, the Full Deco Deluxe Sitar not only has a more elaborate decoration compared to the Full Deco Sitars, but is also built with even more carefully selected, seasoned woods. 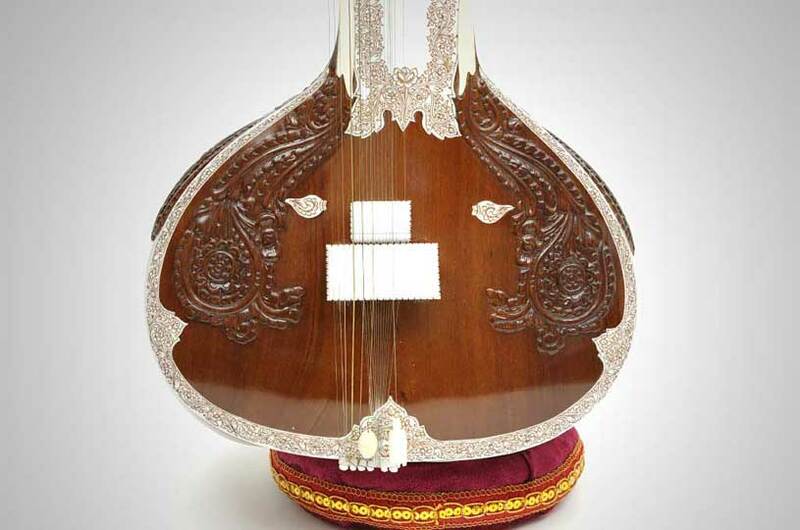 The Full Deco Deluxe model by P. & Brothers is a Sitar with the highest demand for perfection. 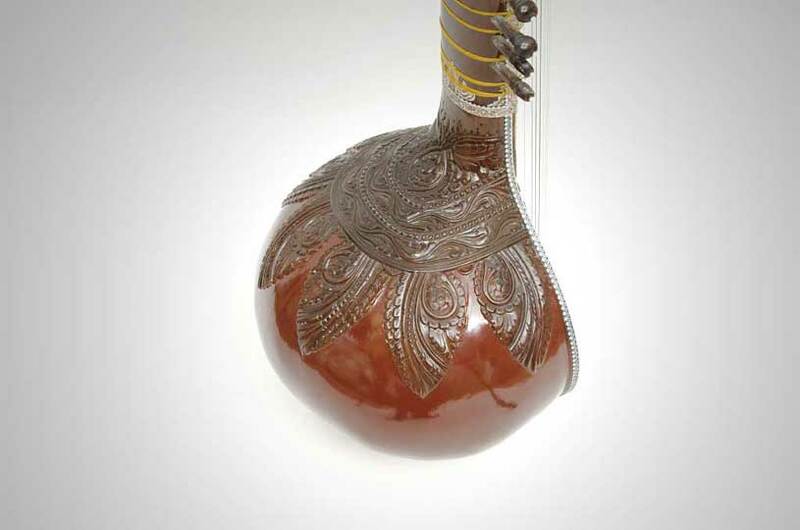 The well-balanced sound, which is on a similar level to that of a HIren Roy Sitar, makes this Sitar a professional instrument that meets the highest concert demands. The Full Deco Deluxe Sitar by P. & Brothers meets the high quality demands of fastidiously musicians who prefer a compact, slim and grippy tone with excellent sustain and a wide dynamic range. 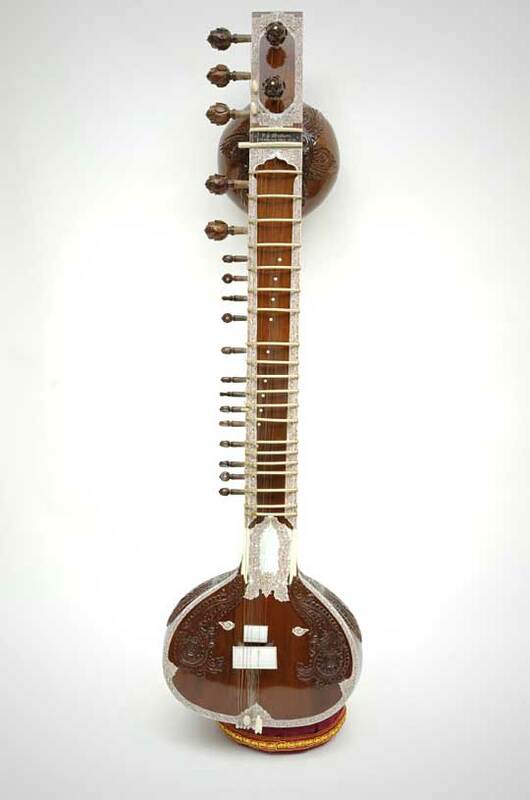 This sitar is a perfect match for the sound ideal that has prevailed in India for decades with the spread of microphones and amplification equipment on concert stages. 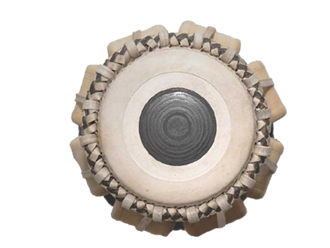 As with the Hiren Roy, this deluxe model also features a thicker TABLI ( corpus top ), which is particularly important for this special sound concept. However, at the beginning the sitar sounds relatively quieter and needs a longer playing time until the hidden potential unfolds completely. 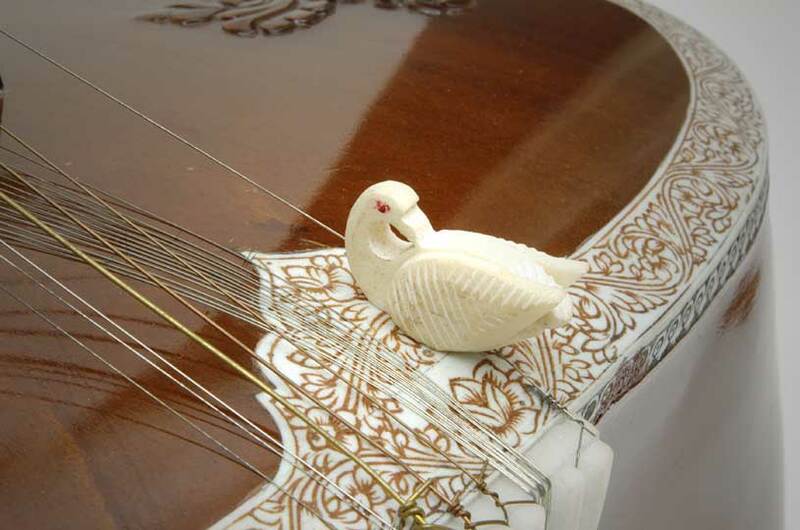 Brown stained tuna wood, highly polished shellac surfaces, 7 playing strings, 13 resonance strings, inlays of celluloid with brown coloured engravings, neck attachment (angur patta) decorated throughout with elaborate carvings, detachable upper resonator (tumba) of pumpkin with threaded socket, synthetic bridges, bone string bars. Two hooks on the uppermost fret allow the two lowest playing strings to be "hooked away"; this prevents the low strings from being struck or resonated unintentionally during powerful fast playing in the middle and high register, thereby darkening and blurring the sound. The resonance strings are guided into the neck at an obtuse angle over mini bridges, thus reducing the tendency to tear. Part of the sound concept is to produce a closed Jowari. Accordingly, the bridge has been carefully grinded to create the characteristic sound. The result is a clear differentiated sound result with a restrained but nevertheless clear overtone richness. 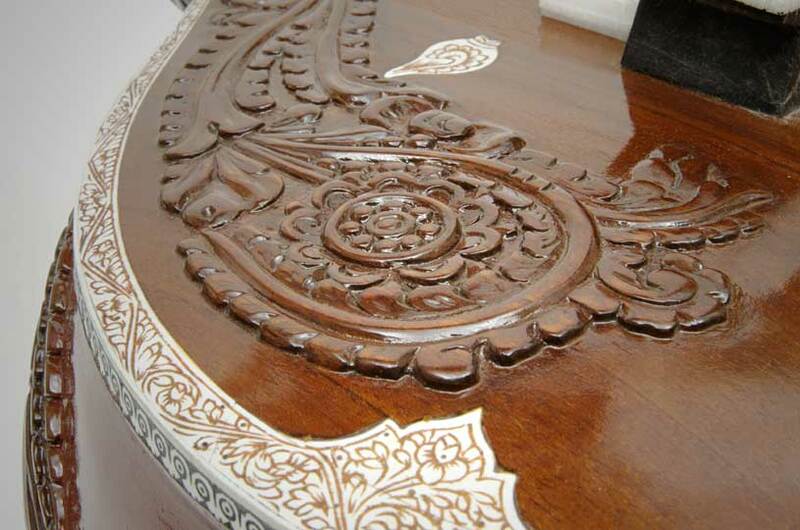 In the past, the bridge of a sitar was grinned to produce an open Jowari. The resulting overtones and the buzzing of the played strings, which are mostly exuberant for today's taste, have been abandoned for quite some time, at least with professional sitars. Today's sitarists prefer a closed Jowari. Since the year 2000, synthetic bridges have been used instead of the horn and bone bridges that were common in the past. This has the advantage that these bridges keep the ground Jowari much longer and have to be regrinded less often, because they are harder than their predecessors. If the bridge is not resharpened, the closed Jowari will become relative over the years and the sound will approach the open Jowari again by abrasion of the strings on the bridge. However, this only happens if the sitar is played intensively, regularly and for many years. P. & Brothers is a small family business that pays full attention to every instrument it builds in terms of workmanship and sound quality. 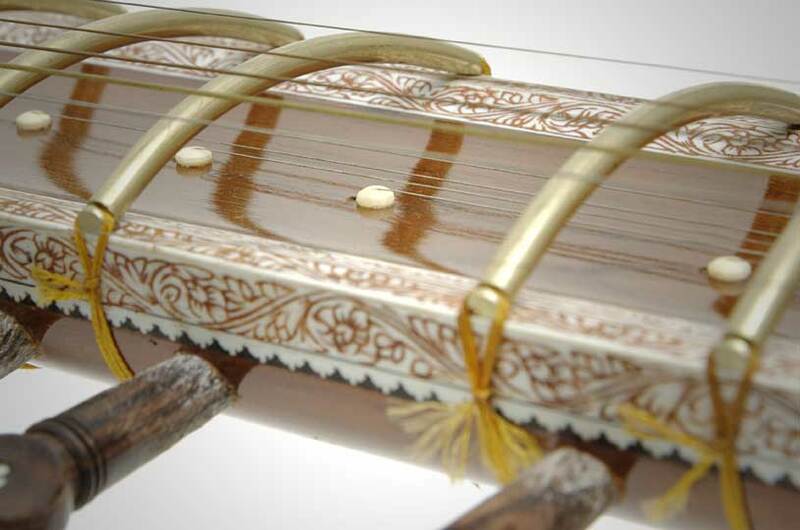 The result is a high quality at a good price and the Sitars are therefore in any case recommendable instruments. The Deluxe Sitar achieves especially high demands because Suman Karmakar, the boss of P. & Brothers, orientates himself on the sound ideal of Hiren Roy and is in a collegial professional exchange with Barun Roy.